A society is a grouping of individuals, which is characterized by common interest and may have distinctive culture and institutions. A "society" may refer to a particular ethnic group, such as the Nuer, to a nation state, such as Switzerland, or to a broader cultural group, such as Western society. An organized group of people associated together for religious, benevolent, cultural, scientific, political, patriotic, or other purposes may also be considered a society. Human beings are essentially social creatures, with the desire and need to be in close contact with others. Beginning with the family, human life is one of interdependence and sharing of physical, mental, and spiritual items. While conflict both within and between societies has been the dominant feature of human history, all societies strive to maintain harmony within (to ensure the happiness and safety of their members) and, at least in more recent times, many now seek harmony among diverse societies in efforts to establish a world of peace and prosperity for all. The term society emerged in the fifteenth century and is derived from the French société. The French word, in turn, had its origin in the Latin societas, a "friendly association with others," from socius meaning "companion, associate, comrade or business partner." Essential in the meaning of society is that its members share some mutual concern or interest, a common objective or common characteristics, often a common culture. Society and culture are similar concepts, but their scopes are different. A society is an interdependent community, while culture is an attribute of a community: the complex web of shifting patterns that link individuals together. For example, Clifford Geertz suggested that "society" is the actual arrangement of social relations while "culture" consists of beliefs and symbolic forms. Edward Burnett Tylor wrote in 1871 that "culture or civilization, taken in its wide ethnographic sense, is that complex whole which includes knowledge, belief, art, morals, law, custom, and any other capabilities and habits acquired by man as a member of society." How humans think and exchange information. The sensory world makes up only a fraction of human experience, so in order to understand the world, we have to conceive of human interaction in the abstract, namely society. Many phenomena cannot be reduced to individual behavior. In order to explain certain conditions, a view of something "greater than the sum of its parts" is needed. Collectives often endure beyond the lifespan of individual members. The human condition has always meant going beyond the evidence of our senses. In other words, every aspect of our lives is tied to the collective sense. It should be noted, however, that some theorists, particularly Marxists, have argued that there is no entity that we could call "society." The concept of a society as the sum total of social relations among members of a community contrasts with the perspective where society is simply the sum total of individuals in a territory, having no independent existence or characteristics beyond that which can be described on another level. In the view of Karl Marx, human beings are intrinsically, necessarily, and by definition social beings who—beyond being "gregarious creatures"—cannot survive and meet their needs other than through social co-operation and association. Their social characteristics are therefore to a large extent an objectively given fact, stamped on them from birth and affirmed by socialization processes; and, according to Marx, in producing and reproducing their material life, people must necessarily enter into relations of production which are "independent of their will." By contrast, the sociologist Max Weber defined human action as "social" if, by virtue of the subjective meanings attached to the action by individuals, it "takes account the behavior of others, and is thereby oriented in its course." In this case, the "social" domain really exists only in the intersubjective relations between individuals, but by implication the life of these individuals also exists in part outside the social domain. "Social" is thus implicitly also contrasted with "private." A social fact is every way of acting, fixed or not, capable of exercising on the individual an influence, or an external constraint; or again, every way of acting which is general throughout a given society, while at the same time existing in its own right independent of its individual manifestations. Durkheim gave a non-individualistic explanation of social facts arguing that social phenomena arise when interacting individuals constitute a reality that can no longer be accounted for in terms of the properties of individual actors. He distinguished between a traditional society–"mechanical solidarity"–which prevails if individual differences are minimized, and the modern society-"organic solidarity"–that develops out of cooperation between differentiated individuals with independent roles. In Durkheim's view, sociology as the study of society and human social interaction is "the science of social facts." Hunter-gatherer bands, which are generally egalitarian. Tribal societies, in which there are some limited instances of social rank and prestige. Chiefdoms, stratified structures led by chieftains. Societies consist minimally of a large extended family, and generally as groups of families connected either by kinship or by geopolitical factors (location, resources, common enemies, and so forth). Over time, some cultures progressed toward more complex forms of organization and control. This cultural evolution has a profound effect on patterns of community. Hunter-gatherer tribes settled around seasonal food supplies eventually become agrarian villages. Villages grew to become towns and cities. Cities turned into city-states and nation-states. Ultimately, there is the level of all humanity, humankind. As far back as our knowledge takes us, human beings have lived in families. We know of no period where this was not so. We know of no people who have succeeded for long in dissolving the family or displacing it ... Again and again, in spite of proposals for change and actual experiments, human societies have reaffirmed their dependence on the family as the basic unit of human living—the family of father, mother and children. A band society is the simplest form of human society. A band generally consists of a small kinship group, often no larger than an extended family or small clan. Bands have very informal leadership; the older members of the band generally are looked to for guidance and advice, but there are none of the written laws and law enforcement like that seen in more complex societies. Band customs are almost always transmitted orally. Formal social institutions are few or non-existent. Religion is generally based on family tradition, individual experience, or counsel from a shaman. Bands are distinguished from tribes in that tribes are generally larger, consisting of many families. Tribes have more social institutions and clearly defined leadership such as a "chief," or "elder." Tribes are also more permanent than bands; a band can cease to exist if only a small group walks out. Many tribes are in fact sub-divided into bands, in the United States, for example, many Native American tribes are made up of official bands living in specific locations. A clan is a group of people united by kinship and descent, which is defined by perceived descent from a common ancestor. Even if actual lineage patterns are unknown, clan members nonetheless recognize a founding member or "apical ancestor." As kinship based bonds can be merely symbolic in nature some clans share a "stipulated" common ancestor, which is a symbol of the clan's unity. When this ancestor is not human, this is referred to a totem. Generally speaking, kinship differs from biological relation, as it also involves adoption, marriage, and fictive genealogical ties. Clans can be most easily described as sub-groups of tribes and usually constitute groups of seven to ten thousand people. A tribe, viewed historically or developmentally, consists of a social group existing before the development of, or outside of, states, though some modern theorists hold that "contemporary" tribes can only be understood in terms of their relationship to states. The term is often loosely used to refer to any non-Western or indigenous society. In common understanding the word "tribe" is a social division within a traditional society consisting of a group of interlinked families or communities sharing a common culture and dialect. In the contemporary western mind the modern tribe is typically associated with a seat of traditional authority (tribal leader) with whom the representatives of external powers (the governing state or occupying government) interact. For various reasons, the term "tribe" fell into disfavor in the latter part of the twentieth century. For many anthropologists, when the term was clearly defined it became an "ideal" concept, with no basis in reality. Thus, it was replaced with the designation "ethnic group," which defines a group of people of common ancestry and language, shared cultural history, and an identifiable territory. Nevertheless, the term tribe is still in common use and the term used for recognized Native American governments in the United States. An ethnic group is a human population whose members identify with each other, usually on the basis of a presumed common genealogy or lineage. Ethnic groups are also usually united by common cultural, behavioral, linguistic, or religious practices. In this sense, an ethnic group is also a cultural community. This term is preferred over tribe, as it overcame the negative connotations that the term tribe had acquired under colonialism. A chiefdom is any community led by an individual known as a chief. In anthropological theory, one model of human social development describes a chiefdom as a form of social organization more complex than a tribe, and less complex than a state or a civilization. The most succinct (but still working) definition of a chiefdom in anthropology belongs to Robert Carneiro: "An autonomous political unit comprising a number of villages or communities under the permanent control of a paramount chief." Chiefdoms have been shown by anthropologists and archaeologists to be a relatively unstable form of social organization. They are prone to cycles of collapse and renewal, in which tribal units band together, expand in power, fragment through some form of social stress, and band together again. An example of this kind of social organization would be the Germanic Peoples who conquered the western Roman Empire in the fifth century C.E. Although commonly referred to as tribes, the Germanic Peoples were by anthropological definition not tribes, but chiefdoms. They had a complex social hierarchy consisting of kings, a warrior aristocracy, common freemen, serfs, and slaves. Chiefdoms are characterized by pervasive inequality of peoples and centralization of authority. At least two inherited social classes (elite and commoner) are present, although social class can often be changed by extraordinary behavior during an individual's life. A single lineage/family of the elite class will be the ruling elite of the chiefdom, with the greatest influence, power, and prestige. Kinship is typically an organizing principle, while marriage, age, and gender can affect one's social status and role. A state is a political association with effective dominion over a geographic area. It usually includes the set of institutions that claim the authority to make the rules that govern the people of the society in that territory, though its status as a state often depends in part on being recognized by a number of other states as having internal and external sovereignty over it. In sociology, the state is normally identified with these institutions: in Max Weber's influential definition, it is that organization that has a "monopoly on the legitimate use of physical force within a given territory," which may include the armed forces, civil service, or state bureaucracy, courts, and police. A city-state is a region controlled exclusively by a city, usually having sovereignty. Historically, city-states have often been part of larger cultural areas, as in the city-states of ancient Greece (such as Athens, Sparta and Corinth), the central Asian cities along the Silk Road (which included Samarkand and Bukhara), or the city-states of Northern Italy (especially Florence and Venice). Among the most creative periods in human history are those in which humanity organized itself in small independent centers. However, these small creative groupings usually survived for only short periods of time because they lacked the size and strength to defend themselves against the onslaught of larger social entities. Thus, they inevitably gave way to larger organizations of society, the empire and eventually the nation-state. Today, only Singapore, Monaco, and Vatican City arguably remain autonomous city-states. The modern nation-state is larger and more populous than the city-states of ancient Greece or Medieval Europe. Those states were governed through face-to-face relationships of people that often lived within the walls of the city. The nation-state also differs from an empire, which is usually an expansive territory comprising numerous states and many nationalities which is united by political and military power, and a common currency. The language of an empire is often not the mother tongue of most of its inhabitants. There are two directions for the formation of a nation-state. The first—and more peaceful way—is for responsible people living in a territory to organize a common government for the nation-state they will create. The second, and more violent and oppressive method—is for a ruler or army to conquer a territory and impose its will on the people it rules. The modern nation-state is relatively new to human history, emerging after the Renaissance and Reformation. It was given impetus by the throwing off of kings (for example, in the Netherlands and the United States) and the rise of efficient state bureaucracies that could govern large groups of people impersonally. Frederick the Great in Germany is frequently cited as one of the originators of modern state bureaucracy. It is based on the idea that the state can treat large numbers of people equally by efficient application of the law through the bureaucratic machinery of the state. Generally the members of a society have a shared belief or common goal that binds them together. On the most basic level, that of a family or extended family, they share a common blood lineage. 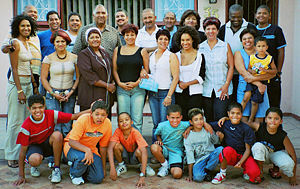 Some larger social groups, such as clans and ethnic groups also share a common lineage, although the connections may be more distant. Ferdinand Tönnies argued that social groups can exist as personal and direct social ties that either link individuals who share values and belief (gemeinschaft) or impersonal, formal and instrumental social links (gesellschaft). In reality, though, all societies contain some elements of both types. There are also "secret societies," organizations that conceal their activities and membership from outsiders. The term "secret society" is also often used by the general public to describe a wide range of organizations, including college fraternities and fraternal organizations that may have non-public ceremonies. Freemasonry has often been called a "secret society" although Freemasons themselves argue that it is more correct to say that it is an esoteric society, in that certain aspects are private. The most common phrasing being that Freemasonry has, in the twenty-first century, become less a secret society and more of a "society with secrets." Some academic, learned, and scholarly associations describe themselves as "societies" (for example, the American Society of Mathematics. More commonly, professional organizations often refer to themselves as societies (for example, the American Society of Civil Engineers or the American Chemical Society). In the United Kingdom and the United States, learned societies are normally nonprofit and have charitable status. In science, they range in size to include national scientific societies (such as the Royal Society) to regional natural history societies. Academic societies may have interest in a wide range of subjects, including the arts, humanities, and science. Peoples of many nations united by common political and cultural traditions, beliefs, or values may be said to be a society (such as Judeo-Christian, Eastern, and Western). When used in this context, the term is employed as a means of contrasting two or more "societies" whose members represent alternative conflicting and competing worldviews. Human societies are often organized according to their primary means of subsistence. As noted above, social scientists identify hunter-gatherer societies, nomadic pastoral societies, horticulturalist or simple farming societies, and intensive agricultural societies, also called civilizations. Some consider industrial and post-industrial societies to be qualitatively different from traditional agricultural societies. Societies may also be organized according to their political structure. In order of increasing size and complexity, there are bands, tribes or ethnic groups, chiefdoms, and state societies. These structures may have varying degrees of political power, depending on the cultural geographical, and historical environments that these societies must contend with. Thus, a more isolated society with the same level of technology and culture as other societies is more likely to survive than one in closer proximity to others that may encroach on their resources. A society that is unable to offer an effective response to other competing societies will usually be subsumed into the culture of the more successful, competing society. One common theme for societies is that they serve to aid individuals in a time of crisis. Traditionally, when an individual requires aid, for example at birth, death, sickness, or disaster, members of that society will rally others to render aid, in some form—symbolic, linguistic, physical, mental, emotional, financial, medical, or religious. Many societies will distribute largess, at the behest of some individual or some larger group of people. This type of generosity can be seen in all known cultures; typically, prestige accrues to the generous individual or group. Conversely, members of a society may also shun or scapegoat members of the society who violate its norms. Mechanisms such as gift exchange and scapegoating tend to be institutionalized within a society. Some societies will bestow status on an individual or group of people, when that individual or group performs an admired or desired action. This type of recognition may be bestowed by members of that society on the individual or group in the form of a name, title, manner of dress, or monetary reward. 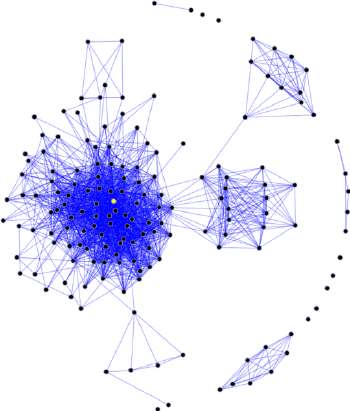 Social networks are basically maps of the relationships between people. 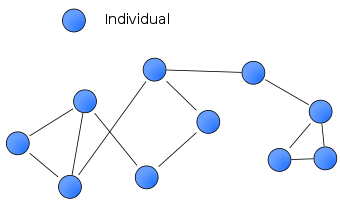 Structural features such as proximity, frequency of contact, and type of relationship (such as relative, friend, colleague) define various social networks. Research in a number of academic fields has shown that social networks operate on many levels, from families up to the level of nations, and play a critical role in determining the way problems are solved, organizations are run, and the degree to which individuals succeed in achieving their goals. There is no assumption that groups of people must be in physical proximity in order to be the building blocks of society: less-bounded social systems, from nonlocal communities to links among Internet sites become potential origins of societies. Individuals (persons, organizations, states) are not the most important features; the structure of their relationships become more significant. The process of becoming a fully accepted member of a society may not depend on socialization into a fixed set of norms, but rather the structure and composition of relationships among members of the society affect the norms of appropriate behavior. Social norms are rules or standards of behavior shared by members of a social group. A norm is an expectation of how people will behave, and generally it takes the form of a rule that is socially rather than formally enforced. Norms may be internalized—incorporated within the individual so that there is conformity without external rewards or punishments, or they may be enforced by positive or negative sanctions from without. There are two schools of thought regarding norms. One view maintains that norms reflect a consensus, a common value system developed through socialization, the process by which an individual learns the culture of his group. Norms contribute to the functioning of the social system and are said to develop to meet certain assumed “needs” of the system. On the other hand, conflict theory holds that norms are a mechanism for dealing with recurring social problems. In this view, norms are imposed by one section of a society as a means by which it can dominate and exploit others. Norms may take the form of customs, the society's web of cultural rituals, traditions, and routines. These may not be punished severely. Norms that involve moral judgments that define wrong and right behavior, the allowed and the disallowed, what is wanted and not wanted within a culture—the taboo—these are more serious. Violation of such norms is usually considered by society as a threat to social organization and harshly sanctioned. Examples of this type include sexual promiscuity, and extreme styles of dress. In highly organized societies, norms are formalized and precisely delimited. Certain types of rules or customs may become law, and regulatory legislation may be introduced to formalize or enforce the convention (such as laws which determine which side of the road vehicles must be driven). The breaking of legal norms invokes procedures and judgments through formal, legal institutions, such as police or the courts, set up to enforce them. These norms generally relate to individual violations of mores or to the adjustment of proprietary relationships. In a social context, a convention may retain the character of an "unwritten law" of custom (such as the manner in which people greet each other—by shaking each other's hands, bowing, and so forth). In early, non-specialized societies, people pooled their labor for the production of the necessities for survival. They tended to behave and think alike as they worked to achieve group-oriented goals. When societies became more complex, work became more specialized, and social bonds grew more impersonal as the culture shifted from altruism to economic where labor was exchanged for money. Individuals found it difficult to establish their status and role in society without clear norms to guide them. If conditions changed quickly, say during great prosperity or a great depression, the social system came under pressure and the erosion of existing norms without clear alternatives led to dissatisfaction, conflict, and deviance. Emile Durkheim introduced the concept of anomie to describe an emerging state of social deregulation, one in which the norms or rules that regulated people's expectations as to how they ought to behave were eroding and so people no longer knew what to expect from one another. This creates a society in which individual desires are no longer regulated by common norms becomes one where individuals are left without moral guidance in the pursuit of their goals, both on the individual level or in service to the society as a whole. In such a situation, the society inevitably fails. ↑ Richard Jenkins, Foundations of Sociology (London: Palgrave MacMillan, 2002, ISBN 0333960505). ↑ Franz Oppenheimer, The State 1922. Retrieved August 21, 2018. ↑ Gerhard Lenski, Human Societies - A New Introduction to Sociology (New York, NY: McGraw Hill, 1970, ISBN 978-0070371668). ↑ Margaret Mead and Ken Heyman, Family (New York, NY: Macmillan, 1965, ISBN 978-0025836907), 77-78. ↑ Anthony D. Smith, The Ethnic Origins of Nations (Oxford: Blackwell Publishing, 1988, ISBN 0631161694). ↑ Robert L. Carneiro, "The Nature of the Chiefdom as Revealed by Evidence from the Cauca Valley of Colombia." in A. Terry Rambo and Kathleen Gillogly (eds. ), Profiles in Cultural Evolution (Ann Arbor, MI: University of Michigan Press, 1991, ISBN 978-0915703234). ↑ Sri Aurobindo, "Ideal of Human Unity." In Social and Political Thought (Sri Aurobindo Ashram, 1970). ↑ United Grand Lodge of England, Constitutions of the Antient Fraternity of Free and Accepted Masons (Wentworth Press, 2016). ↑ Reynold S. Davenport, Freemasonry Revealed: The Secrets of Freemasonry Grand Lodge of North Carolina, 1980. Retrieved August 21, 2018. Aurobindo, Sri. Social and Political Thought. Sri Aurobindo Ashram, 1970. Simmel, Georg. Sociology: Investigations on the Forms of Sociation. 1908. United Grand Lodge of England. Constitutions of the Antient Fraternity of Free and Accepted Masons. Wentworth Press, 2016. This page was last modified on 21 August 2018, at 16:33.